21 Make for Me a mizbayach of earth and sacrifice on it your burnt offerings and your sacrifices of well-being, your sheep and your oxen; in every place where I cause My name to be mentioned I will come to you and bless you. Based on this verse, Rashi explains that God’s forty-two letter name can only be uttered where the Divine Presence resides. The Beit Hamikdash in Yerushalayim was, therefore, the only place where the Kohanim could use this special name when giving the priestly blessing to the people. 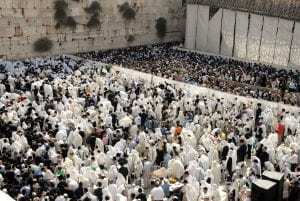 The description of the blessing, found in Sefer Bamidbar (6:23-27), ends with the following verse: “Thus they shall link My name with the People of Israel, and I will bless them.” Even though the Kohanim were the ones standing in front of the people and invoking Hashem’s name to bless them, the blessing itself comes from Hashem. To this day, the priestly blessing is recited daily throughout Israel. In the rest of the world, this blessing is only recited a few times a year, on holidays. The recitation of the Priestly Blessing is a constant reminder that all blessing in our lives ultimately comes from Hashem.